Reykjavik's greatest celebration in the year is their ;Culture Night, or ;Menningarnott. It's an event ;created and organised by city residents ;and typically marks the ;beginning of Reykjavik's cultural year, when all of the museums and theatres launch their new programme of events. What better way to tell people about upcoming events than by staging one of the largest events across town? Culture Night is now so established within Reykjavik's annual calendar that it celebrates its 20th year on ;22 August. 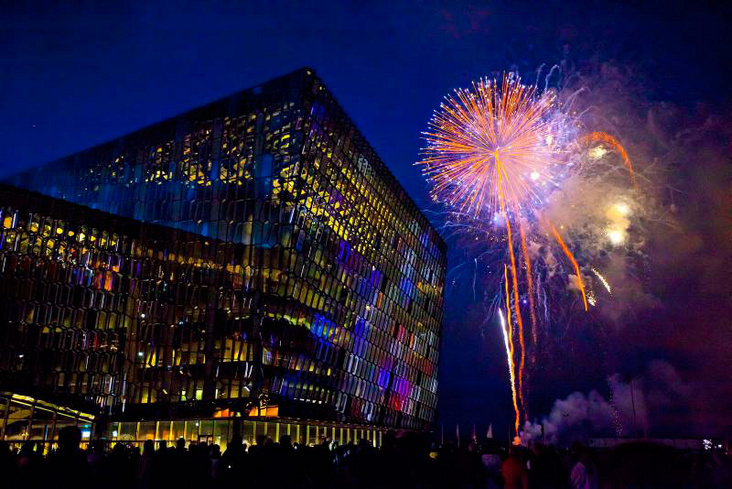 The program of events starts at the beginning of the day and runs through until an amazing ;fireworks display at Harpa concert hall around 11pm. ;It's family friendly and offers everything from dance, theatre and music to graffiti art, air displays and late opening hours at bars and restaurants. What's more, ;all events are free for anyone to enjoy! The Culture Night slogan is ;"come on in! ", referring back to Iceland's principle of hospitality. This principle has long run through the country for years, and this night is a way to celebrate it entirely. ;Anyone can apply to take part and everyone is welcome, meaning it's Reykjavik's most successful and friendly event of the year!